When living each and every day with an excruciatingly painful, debilitating, rare disease, it’s natural to become desperate for help. Unfortunately there are far too many unscrupulous individuals who look to take advantage of people just like us, preying on our understandable desperation. Just as dangerous – but not as villainous – are the countless well-meaning individuals who, despite their good intentions, share information that can be potentially deadly. We’ve seen far too many friends and loved ones fall into these traps and face real, long-lasting harm. To help combat this trend, we’ve put together a list of common red flags of warning that you need to look out for. Please, take the time to read through this and consider it carefully. If you ever find yourself in a situation that makes you feel uneasy, listen to your gut instinct. 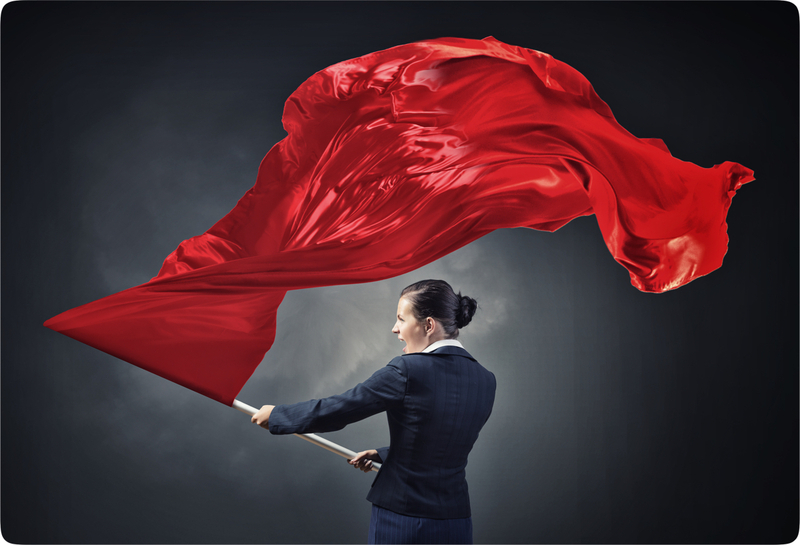 Oftentimes your subconscious mind will pick up on red flags like these before we’ve even realized it. When it comes to your health, you are your own best advocate! You know better than most how fleeting our health can be. Protect it! Be wary of anyone who discourages you from seeking a second opinion. No human being is perfect and no one can know all there is to know. No doctor is a God. The best doctors on the planet know it takes a team to reach the best result. If your doctor is behaving differently, there’s likely something very wrong with what they want you to do. Does your doctor routinely bad-mouth or attempt to discredit other doctors? That’s incredibly unprofessional and quite worrisome. If the doctor in question has a financial interest in their recommendations, but fails to disclose that fact. For instance, if a doctor recommends an experimental treatment from a company that they happen to own part of. Incidentally, failure to disclose such financial interests is a violation of law. That exact circumstance has happened in the Dercum’s community. Pressuring you to ask another doctor to order specific blood tests, rather than ordering the tests themselves. This is considered highly unethical, as doctors are professionally responsible for the tests that they order. If they order a given test, they must have some idea of what they will do if that test comes back abnormal. If a test does come back abnormal and they fail to act, that is a form of medical malpractice. For that and many other similar reasons, it is not ethical for one doctor to get another to order tests for them, either directly or indirectly via coercion of the patient. Beware of loners/outliers, especially if they make claims of persecution of conspiracies. Meaning, if there seems to be a wide consensus of information from a wide variety of reliable sources, yet “Bob’s Fat Research Institute” offers their own unique or even contradictory theories. It’s probably “Bob’s Institute” you should be wary of, not the vast consensus from tried and true scientific medical organizations. It’s all the more concerning if “Bob’s Institute” claims that they’re the victims of persecution, a code of silence, evil big pharmaceutical companies, or some other sort of vast conspiracy. Beware of hype. If it sounds too good to be true, it definitely is. Beware of doctors offering cure-alls. No one substance could possibly cure absolutely every ailment or every symptom you’re experiencing. Again, if it sounds too good to be true, it probably is. Look for contrary information and opinions. If you’re reading information from a doctor – or anyone – trying to convince you of a treatment or product, actively try to find out what the critics are saying. Ask yourself, “Is there another side to this story?”, “What do other people believe?”, “Is there a study that shows negative outcomes out there?”. Examine all sides of every story and see which one sounds more realistic, credible, and scientific. If a doctor has a history of suddenly moving from one state to another, without reasonable cause. This can be a sign of a quack trying to evade state-led investigations. It happens far more often than you might think. Be especially wary of anyone – especially doctors – selling or pressuring you into trying something because it’s “all natural”. Just because something is natural does NOT mean it’s safe! Think of it this way. If something is powerful enough to help you, isn’t it also powerful enough to hurt you? Cyanide is perfectly natural. Arsenic is perfectly natural. Both of them will still kill you. Even substances that aren’t dangerous alone could easily interact with medications you’re taking. Those interactions can be deadly! Always consult with your doctor before trying any new treatment. If someone’s trying to sell you a treatment without advising the same, be exceedingly wary! Beware of any sources that are trying to sell you something, even if it appears helpful or well-intentioned. Sales ultimately end up distorting information in order to separate you from your money. Beware of “institutes” that seem to be promoting a single individual. If they only ever advertise the research of a single doctor, that’s not a good sign. Don’t trust testimonials! The reason sites use testimonials is because they don’t have scientific data or actual clinical studies to back up their claims. As scientists say, the plural of anecdote is anecdotes, not data. Some anecdotal evidence is okay if it’s not advocating anything drastic or trying to separate you from your money. But don’t accept testimonials or anecdotal data as gospel or as a singular source. Be wary of “conferences” with huge price tags, that only include one participant organization or feature only one doctor. These are almost always scams that will not do you any good at all. Be especially wary of anyone selling or pressuring you into trying something because it’s “all natural”. Just because something is natural does NOT mean it’s safe! Think of it this way. If something is powerful enough to help you, isn’t it also powerful enough to hurt you? Cyanide is perfectly natural. Arsenic is perfectly natural. Both of them will still kill you. Even substances that aren’t dangerous alone could easily interact with medications you’re taking. Those interactions can be deadly! Always consult with your doctor before trying any new treatment. If someone’s trying to sell you a treatment without advising the same, be exceedingly wary! Any doctor or group who explicitly or implicitly discourages dissent, attempts to exclude those who disagree, or encourages followers to trust in them and them alone. Medical science is not a religion and should not be expected to be believed based on faith. If any doctor or institution tries to equate patient surveys or individual case studies with actual long term, double blinded clinical research. That difference should be acknowledged and there should be a healthy respect for the difference between anecdotal evidence and actual research. Beware of sources that are trying to sell you something, even if it appears helpful or well-intentioned. Sales ultimately end up distorting information in order to separate you from your money. Beware of outliers, especially if they make claims of persecution of conspiracies. Meaning, if there seems to be a wide consensus of information from a wide variety of reliable sources, yet “Bob’s Fat Research Institute” offers their own unique or even contradictory theories. It’s probably “Bob’s Institute” you should be wary of, not the vast consensus from tried and true scientific medical organizations. It’s all the more concerning if “Bob’s Institute” claims that they’re the victims of persecution, a code of silence, evil big pharmaceutical companies, or some other sort of vast conspiracy. Don’t believe conspiracy theories! They’re there to distract you from a lack of verifiable data. Beware of cure-alls. No one substance could possibly cure absolutely every ailment or every symptom you’re experiencing. Again, if it sounds too good to be true, it probably is. Look for contrary information and opinions. If you’re reading information from someone trying to convince you of a treatment or product, actively try to find out what the critics are saying. Ask yourself, “Is there another side to this story?”, “What do other people believe?”, “Is there a study that shows negative outcomes out there?”. Examine all sides of every story and see which one sounds more realistic, credible, and scientific. Don’t trust friend-of-a-friend urban legends. Don’t give in to group-think. It’s all too easy for groups to become echo chambers. I’ve personally witnessed a great deal of bullying and coercion within Dercum’s support groups. It breaks my heart. Anyone who dares express words of caution against the latest health fad, anyone who voices a contrary word against someone trying to sell the latest natural cure, they all too quickly become targets. Please remember, healthy skepticism is exactly that – healthy! We all have to remember to use our common sense to protect ourselves and our loved ones. Don’t let your group fall into the trap of desperation and end up bullying, hurting, or excluding others. Trust your gut instinct. Does it sound too good to be true? Does something just not feel right? It never hurts to be cautious and careful. When it doubt, get a second opinion from another trusted doctor. It just might save your life.